Curry and soba is a high fat soba noodle dish that uses curry roux to add the flavor of curry to soba noodles. Curry soba containing chicken is very common in restaurants. 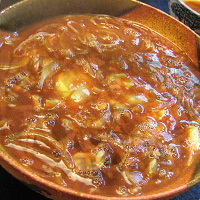 The broth of curry soba is made by mixing buckwheat noodle soup with curry powder. Soy sauce and mirin can be added to fit your taste preference. The calories in Curry and soba per 443.1g(1 cup) is 479 calories. Curry and soba is calculated to be 108Cal per 100 grams making 80Cal equivalent to 74.07g with 64.78g of mostly carbohydrates、18.3g of protein、15.95g of fat in 443.1g while being rich in vitamins and minerals such as Sodium and Vitamin B1.